So as I mentioned yesterday I love juicing! I’ve noticed some major health benefits to juicing which makes the sometimes long process of juicing so incredibly worth it! When I first started juicing, my mom was fighting cancer. I woke up every morning and made us both a big green juice. She loved it! She felt better throughout the day, was able to keep the juice down, it was easy for her to drink, and it was delicious even when chemo altered her taste buds. During the last 2 weeks my mom was alive, these benefits changed to me as now it was about the only thing I could keep down. Juice is packed with so many nutrients and you will feel that benefit indefinitely! So rewind to the first week of my juicing adventure! I bought our juicer the day before I started a new position at work (which had nothing to do with me buying the juicer I just remember the timing). The first morning I juiced I felt great… then the next day came. I literally came down with the worst “cold” of my life. My poor mom had to wear a mask in the house because I literally looked like a small train ran my over! It was awful! Then comes the next day… I wake up with a million pimples. I have always had extremely dry skin and I’ve never dealt with acne so this was surprising to say the least. I didn’t even know what to do with a zit! At this point I’m still thinking I caught this awful monster from work or something but I would soon figure out my body was literally detoxing. At this time of my life I was running 6-10 miles a day and was in great shape so if someone looked at me they’d think I was really healthy. What they wouldn’t know is up to this point I had dealt on and off for many years with an eating disorder. I’m not going to get into this too much right now but I had a horrible body imagine and was about as unhealthy as could be. In fact my doctor told me to stop running because all things combined I’ll probably have a heart attack. So after my gross phase of monster cold finally faded my body literally felt healthy! I could feel my energy level rise, my skin looked way better, and I had better hunger/satisfaction in my diet. Another thing I noticed was little things like achy joints, dry eyes, bloated tummy, swollen fingers all were greatly reduced! This was huge for me! There is no way to possibly consume as many veggies and fruits through whole food as you do through juicing. 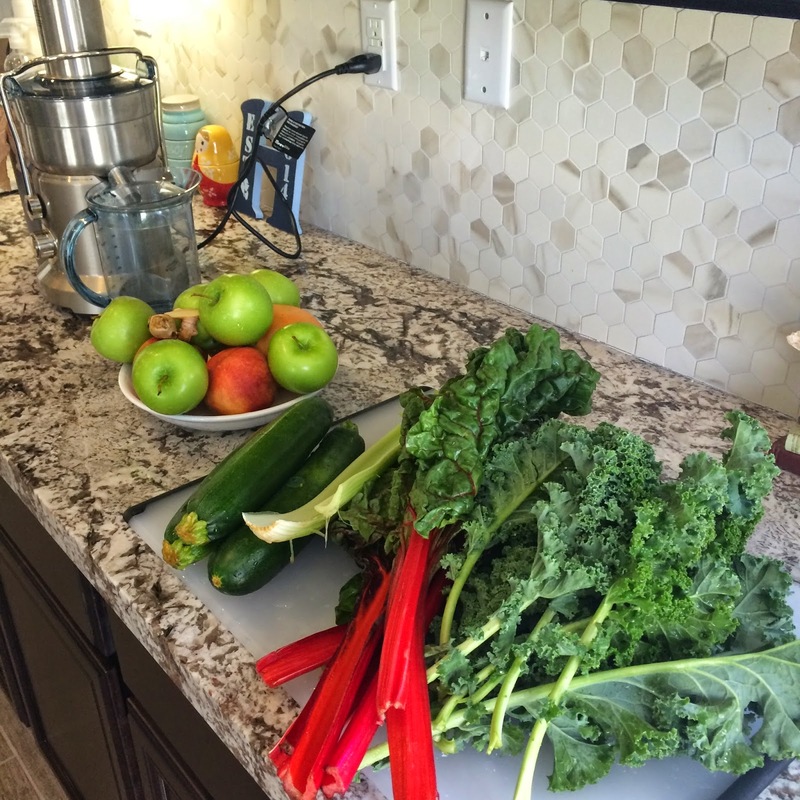 On average, I will juice 5 zucchini, a bunch of chard, a bunch of kale, 2 cups of spinch, 2 apples, ½ grapefruit, and ginger (which is amazing for your tummy) all in one day! If I tried to eat all this I would be eating all day! Plus it tastes amazing! If you have any good recipes pass them along!